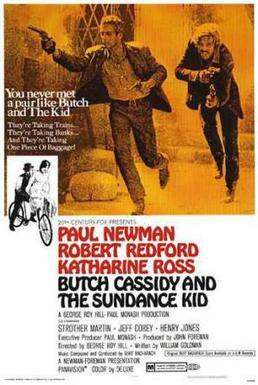 Going into this week's screening, I actually knew very little about Butch Cassidy and the Sundance Kid. I was aware that it stars Robert Redford and Paul Newman and that it had the distinction of being the “longest movie title” on my year’s film list. I actually didn’t even realize it was a western, seeing a Wikipedia thumbnail of two gunman sans hats and assuming it’d be like Dirty Harry or something. Anyway, it is a western but a really unique one. It sort of picks up right in the middle of its characters’ journeys and shows them in decline. A life of bank/train robberies has already made Butch and Sundance legends but marks them as targets. The first act has the two gradually realizing their rope is shortening while the second act forces them on the run. The final 45 minutes, though strange, depicts them fleeing to Bolivia (just as the real Butch and Sundance are suspected to have done), again running out of options. The movie owes everything to its wonderful script and excellent character work. Butch and Sundance’s quick and playful banter hooked me. The dialogue dragged this film out of any western-film clichés and towards a more contemporary buddy flick. When I learned that the script was penned by William Goldman, the author and screenwriter of The Princess Bride, I immediately saw his humor and sympathy portrayed in the characters. And Redford and Newman were perfect for their roles, bringing their characters’ good looks, brooding glances, and witty language to life in a way that was natural and down-right charming. Like Bonnie and Clyde two years before, this film is a buddy anti-hero flick that stretched Hollywood into new places. Not all of the experimenting panned out for me: Some sequences (such as the playful bike-riding scene and the a cappella montage soundtrack) seemed to reek of the hippy-era and didn’t age nicely. But I can forgive the movie for this because of the film’s lasting influence on character. Thanks to flawed, smart, and charming characters, this film seems to be to westerns what Guardians of the Galaxy is to sci-fi. It’s a funny, slow-burn of a movie and totally still worth a watch.